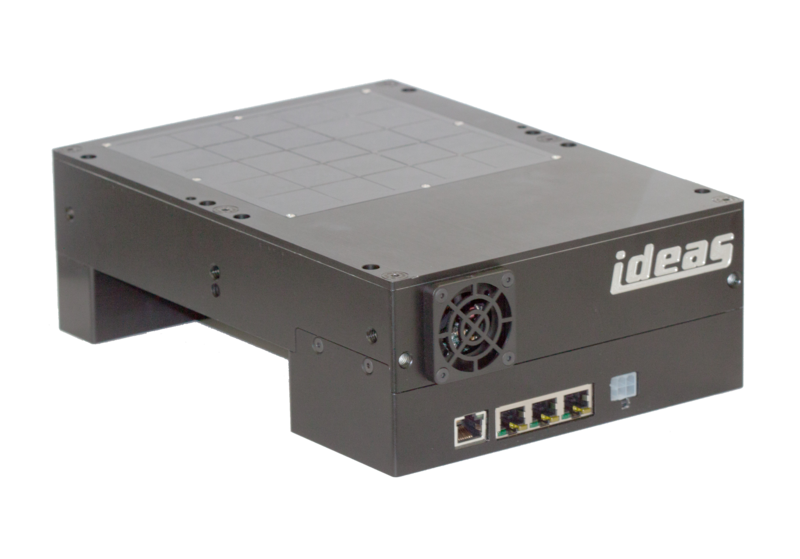 The IDEAS compact gamma-ray camera makes use of room temperature CZT (cadmium zinc telluride) semi-conductors and feature up to 6400 spectroscopic pixels. Each pixel is connected to amplification and trigger circuitry implemented in application specific integrated circuits (ASICs). The camera’s compact mechanical design makes it easy to integrate gamma detection is larger systems. The camera accept various types of collimators. The used technology is insensitive to magnetic fields. To provide additional radiation shielding, the camera can also be delivered with an optional tungsten shielding. The camera connects to external systems via a standard Ethernet network interface. The Ethernet interface is realized through a custom data switch. The custom switch allows for connections to up to 4 cameras – with a total of up to 25600 pixels – making it easy to integrate larger camera arrays. The camera has a modular design and can be delivered in any pixel geometry in blocks of 16×16 pixels. Contact IDEAS for more information.